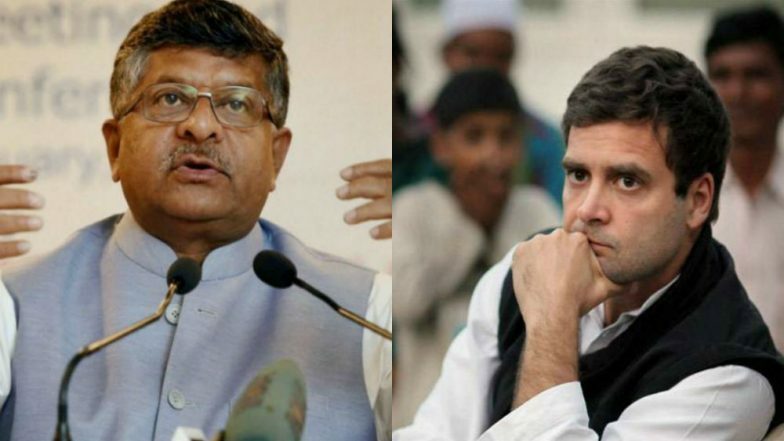 New Delhi, March 23: Union Minister of Law and Justice Ravi Shankar Prasad on Saturday addressed a press conference in New Delhi and raised questions about Indian National Congress President Rahul Gandhi’s source of income. The Bharatiya Janata Party (BJP) leader wondered what could be the source of income of 48-year-old leader other than being an elected lawmaker that his wealth in 2004 was Rs 55 Lakh which rose to Rs 9 crore in 2014. "Rahul Gandhi is a Member of Parliament, his source of income is salary, there's no other clear source. In 2004 election affidavit, he declared his wealth to be ₹55,38,123 it came to ₹2 cr in 2009 and to ₹9 cr in 2014; we would like to know how your asset grew to ₹9 cr from ₹55 lakh," Ravi Shankar Prasad told reporters. Ravi Shankar Prasad Seeks Rahul Gandhi's Apology. The Union Minister also said that there must be 'Robert Vadra Mode of Development', where, you invest few lakhs and it turns out to be crores in a few years. Prasad also mentioned Gandhi family's link to Financial Technologies Limited (FTIL), a company that has a connection to NSEL scam. Meanwhile, Prasad will be the face of the ruling party from Patna Sahib, the seat of actor-turned-rebel Shatrughan Sinha, for Lok Sabha elections. According to reports, Prasad is likely to face Sinha in the national polls as there are speculations that the actor will contest as Congress candidate.